Last edited by b00gym4n; 04-13-2019 at 9:56 AM..
Any magazine that has to be loaded in a certain way or they don’t function correctly isn’t worth the time or money. I’ve never seen that before. The only thing I’ve experienced is stiff springs where the very last rounds have difficulty fitting in. I ended up buying some regular Glock mags and magpul Glock mags, various sizes. 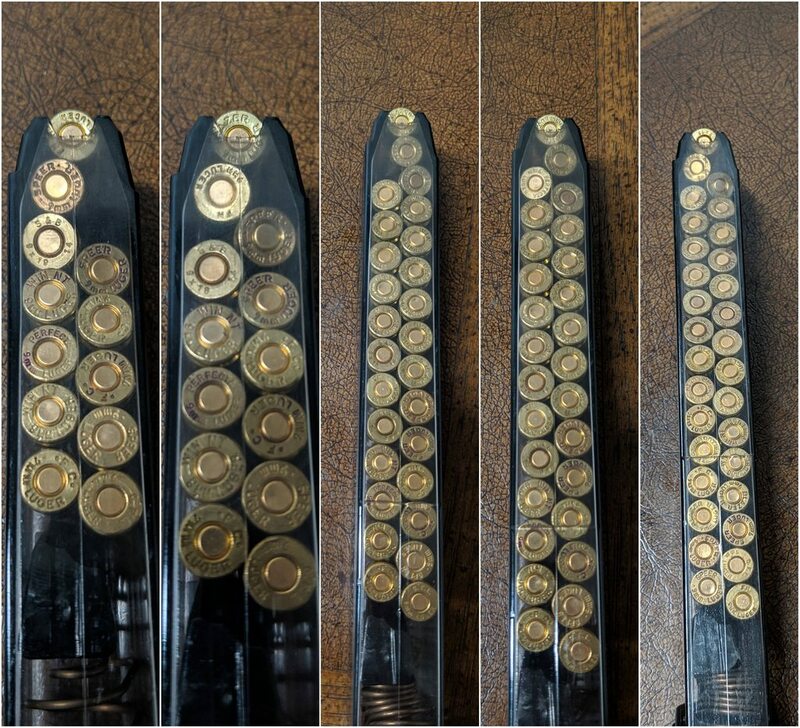 They all fit the correct amount of rounds just loading normally. Yeah that’s odd. But then I’ve never used an ETS. Does it feed all the rounds properly when it has been “bias” loaded? Not sure if you have tried it at range or cycled it? Last edited by Yodaman; 04-13-2019 at 5:04 PM.. I have a few ETS G19 15 round mags and have never had that happen. I have many of their 10 round magazines for my G19 and G17. They do not have the feeding issues, especially with hollow points, that the Glock OEMs are famous for, especially for the G19. The 15 round ETS were stored out of state until Freedom week. I can only suggest cycling rounds through them to see if that fixes the problem. Other than that pay attention when loading and smack the mag to the side you want the round to move to when you see it first appear and before loading another. Sootch00 does not do reviews, he does advertisements. Don't consider this an endorsement, but you can buy Front Sight Diamond memberships off eBay for $39. Well maybe I am bias....but that excuse seems a load of malarkey and doubt its rare. But is to be expected based on my experience with them on their loader. And have since ran into others who have as well. If you research, you will find other cases of their products not working as advertised or consistent with their videos. One could say its a QC problem given they sometimes work great and other times no. But the hallmark of a bad company its to always say its the user versus examine the product and fix it or the issue leading to variation. I bought their loader on the recommendation of a member saying they were good (sale at 2 for 1). But IMHO it is a complete POS. It would only work with some mags, typically with worn springs and was picky with specific brands of ammo (.004 wider rim width would bind in feed chute). Even oiling it continually ever couple mags it was challenged and would jam unlike their video where the guy is using a couple fingers zipping em in like tic tacs. I did find an online review where a guy has the exact problem I did and panned it. They replaced it with another "tuned" one to have him re-review. I got the same malarkey about user error and that I must have damaged it though we confirmed on the phone that was not the case. The had me send it in at my expense and replaced it, but it was just about the same. As watchdog said, a product should work as intended without gymnastics. I just have to think that made in the US is not what it was years ago. I bought a couple of 10 round ETS mags a year or 2 ago based on the positive reviews and they turned out to be garbage. Based on your photos mine may have a spring issue. My springs definitely don't compress as neatly as that, they bend to the side. Also, halfway through the mag I'll get a round that won't feed because the tip wobbles up and down so it isn't pointing up out of the mag. I considered it a lesson learned, but if they weren't 10 rounders I would be more upset. Does it feed all the round properly when it has been “bias” loaded? Not sure if you have tried it at rename or cycled it? I haven't used them at the range yet, but will shortly. If they don't feed properly they're definitely going back. Agreed it's complete bull IMO. The only reason why I haven't considered returning them yet is because I purchased them during our small window of high cap freedom. Lesson learned. Don't buy off brand glock mags. Armorer told us all years ago, Glock magazines cost just a bit more, but you'll get magazines that will function every time. Magpul for AR's and factory for every hand gun I own. An exception to this could be Mec-Gar. They make a lot of the OEM mags so their "aftermarket" stuff is basically the same as OEM. Maybe a different base plate or different color follower. Yes, buy OEM. Cheap mags are cheap, kinda like putting crappy fuel in your car or crappy ammo in your firearm. Maybe these are clear so you can see and correct the issue. I wouldn't admit this in public.. He's the more modern day nutnfancy.. They're both kind of lame.. The only difference is one has a free bonus affirmation at the end of his videos..
Load using an Uplula. It'll likely eliminate the problem and save your thumb at the same time. I used to watch sootch00 and nutnfancy back in 2009 and they were quite informative back then. I guess they've changed since then, but every review I could find online said ETS was up to par. Lesson learned. I have several 15rd and 31rd ETS mags and they always hold the advertised amount. Hopefully all works out for the OP. And the rest can heed this as a warning. I have the same problems with my airsoft magazines. BTW they cost the same as ETS magazines. I’d love to know where you’re buying $10 airsoft mags. I have a whole pile of ETS 10-rd for both a G19 and G17 and never had any issues, shot plenty of matches without issue. I use an uplula. Only thing I am noticing is the outsides getting rough from too much dropping in the dirt, a couple don't drop free as cleanly as they used to. I haven't tried polishing them back up though. I didn't hesitate to pick up standard size ones during freedom week. But I'll also be honest, I keep a OEM glock mag loaded when it's in the nightstand. I have 3 ETS mags for my G26 and they’ve always run fine - but bring short they don’t have much room to wiggle like that. Could be an exception, but I use my pistol at work and my life depends on magazines functioning every time. The only magazines one can count on the most are the ones from the manufacturer. Others might be okay for range work, but why risk failures when for a little more change you can get the "real" ones? Saving a couple of bucks on the very part that causes the most failures to feed makes no sense to me. Same BS happened on my 15 rounders.. I once believed he was doing reviews, then I noticed he never criticized any product. Everything was great. So stopped watching his videos. Wonder if it’s the quality of the spring or the follower. Seems like they are junk. I have noticed that when someone was loading a mag by hand, that happened. However when the same mag was loaded using an Uplula, no bias loading was observed. 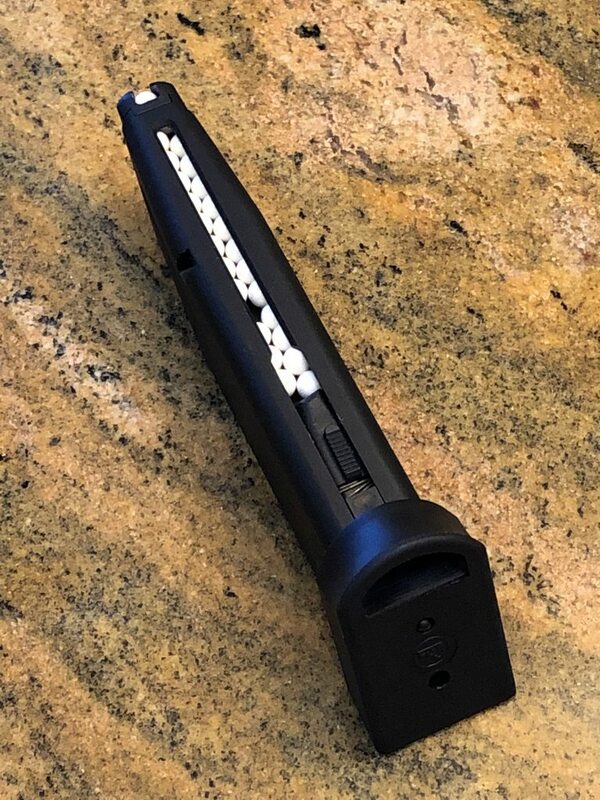 I use the Glock loading tool for all my (Glock style) magazines. We run ETS mags on our AR9 exclusively, as it likes to eat OEM followers. For our specific purposes they've been nothing but quality with no loading or functioning problems. Not to say it doesn't happen, but of the five we've had, no problems in a year and a half of ownership except for theft. But I guess we've only used maglulas. We'll have to give this a try next range trip. Here's a bright comment, how would putting my purse down prevent rounds from coupling the way they do INSIDE the magazine? I've got the 31 round ETS 9mm magazine and load it only by hand. I haven't experienced these problems but I do push straight down while loading rounds in the magazine so I TRIED to reproduce the issue shown by pushing the rounds to one side or the other, whichever the previous round had went to. I was able to briefly stack two rounds on each other while loading (as you'll see in the first and third frames) but the next round loaded always caused the previous rounds to flop back where they should be, ending with a magazine loaded as it should, to 31 rounds, even with trying not to. 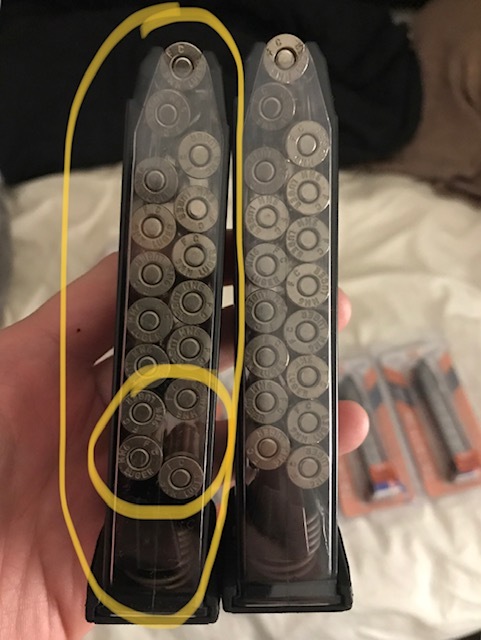 Those of you with the magazines that produce this problem, have you tried pushing straight down on the rounds while loading as they suggested? If so, does that cure the issue or does it continue even while loading in that manner? If you carefully watch how the rounds go in and see that they stack, then remove and reload then it corrects itself. Horrible design either way, I've never had an issue with any magazines doing this, regardless of how they are loaded. When he has inside information on what and how a gun company does, something is off. He is literally reading a script from the manufacturer. wranglerstar is the same way, paid shills for companies and not telling you.